"The flat is large and well appointed with generous space for all living and sleeping areas. It has a generous private outdoor area with beautiful decking and outdoor dining and cooking (BBQ) facilities. The location of the flat is very close to the beach (5 mins walk) but it is set in a very quiet, peaceful and safe residential area. Lots of walking and cycling routes nearby and good links to the town center for shopping etc." "Located in a very quiet area of Anglet, close to the beach, this comfortable apartment is located on the bottom floor of a multi-story house (the owner, when in residence, occupies the top floors)." 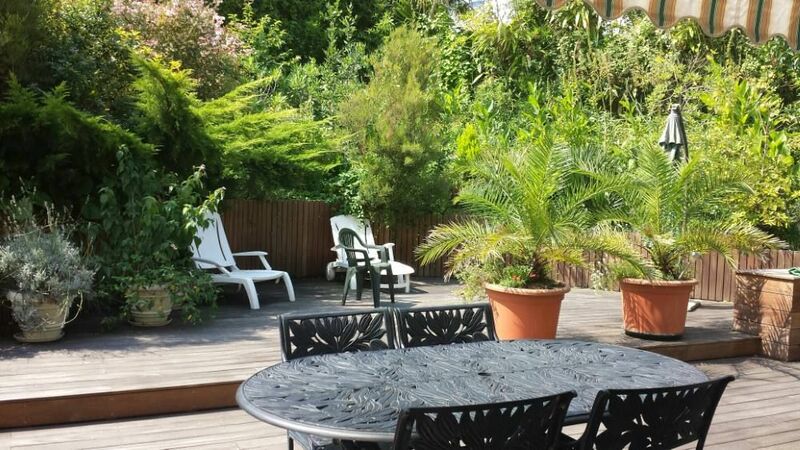 "My wife and I enjoyed 10 days in this wonderful, picturesque garden apartment in the Chiberta neighborhood of Anglet. The facilities possess all the amenities needed to enjoy a stay away from home. Our time was spent reading in the quiet garden and taking walks along the nearby beaches. The owners of this fine rental do everything possible to ensure that their guests are comfortable and well taken care of." "Very, peaceful, great accomodation and excellent facilities. The owners were very helpful, providing lots of information about the surrounding area. "I stayed with my brother and grandparents for a week. The accomodation was excellent, we were made to feel more like friends than guests. The flat is in a perfect position, only a couple of minutes walk from the most consistent break in Anglet. I will be definitely coming back." Very clean and nice appartment, situated in a calm neighborhood. Hosts are very friendly, kind and hospitable. Only 5 minutes care drive to the beach. Very nice place to spend holidays with your family and to discover the "Pays Basque"! + we are all fluent in English!